Because urban and peri-urban wildfires and the ash produced from them can spread chemicals from household hazardous waste, building material, pesticides and fire suppressants into our environment, providing timely science-based information is essential following fire events. 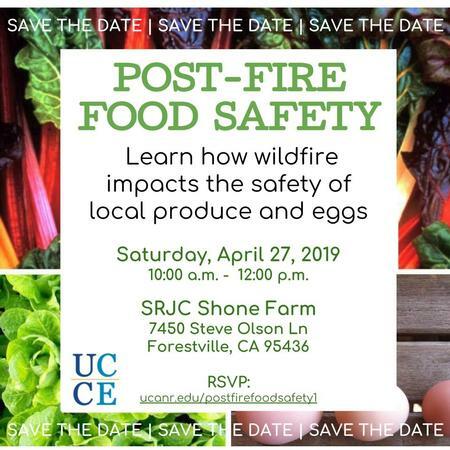 This workshop is designed to leverage our current research efforts related to the potential effects of fire on backyard poultry eggs and backyard gardening with respect to exposure to harmful chemicals including heavy metals, Polychlorinated biphenyls (PCBs) and Polybrominated diphenyl ethers (PBDEs). In addition, web material will share best practices and diagnostic resources after fire events. Current wildfire resources for backyard poultry keepers and backyard gardeners can be found here.